You know who's having a bad day? 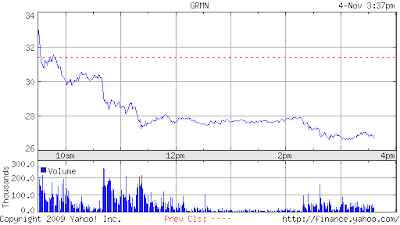 Investors who bought shares of Personal Navigation Device maker Garmin(GRMN) this morning, when the stock was trading up after the company beat earnings estimates handily. You can hardly blame the buyers. At this morning's levels, Garmin shares were well off last recent highs near 40, trading down after rival TomTom reported weak ASP's (average selling price), coupled with the threat from Google's(GOOG) Droid phone (using their Android software), which will include GPS mapping. So after the company reported Q3 earnings per share of 1.03 versus the 69cents expected, people may have felt the shares had been oversold. Those who bought shares in the early minutes of trading today are losing 16% on their trade in a matter of hours. The stock started to slip during the conference call, as management warned that margins and pricing would be weak in the 4th quarter, after a surprisingly strong 3rd quarter performance. In management's words, sales of their highly anticipated G60 phone through AT&T "to be frank, have been slow." Management did their best to remind people on the call that the potentially competing Google mapping software isn't exactly "free," seeing as one needs to purchase a phone to have it. But that was of little comfort to investors. It is striking to see such a massive change in sentiment toward Garmin, without a lot of actual data yet to drive that. The company has lost a full third of its market value in just a couple weeks.